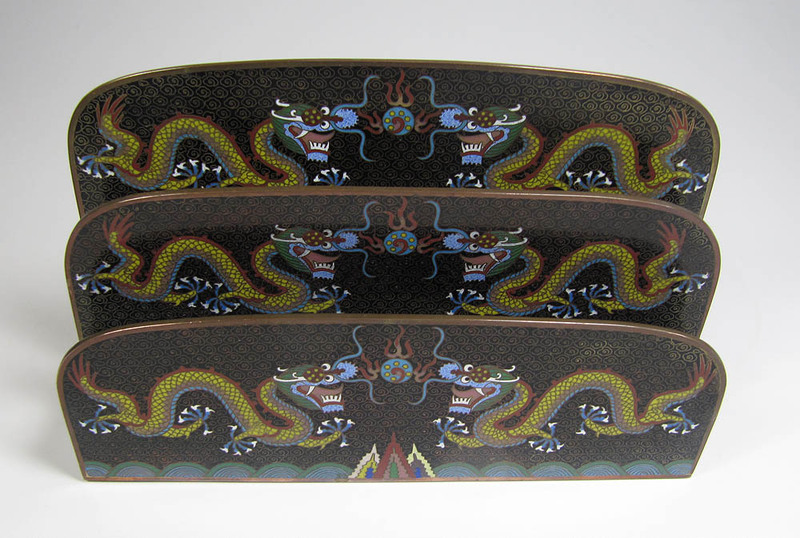 However, the cheerful 20th century Chinese cloisonné dragons are quite distinctive from the bristly Japanese or earlier Chinese representations. Lao Tian Li’s signed pieces are among the best versions, carefully detailed, showing a lively 5-toed dragon with pointed claws and distinct toe pads and spurs on the legs, rounded chin and distinctive bulbous snout with bumpy or spiky edges, a pair of sinuous barbels alongside the nostrils, animated close-set black and white eyes, pronged horns emerging from a bulbous dotted base on the dragon’s forehead, open mouth with curved pointed tongue, angled jaw defined by a double line, fangs with outer pointed tushes, and flowing mane. The body scales are neatly applied, with individual scales following the belly edge (instead of merely a wavy line) and a thin barbed crest along the back. Head, claws, tail and body are proportionate to one another. Uniform small rounded crinkly clouds with a tight round center fill the background and are very neatly and evenly applied. 2) a frontal rather geometric head-on view with a spotted forehead, squared lower jaw, and “Comin’ atcha!” expression. This latter frontal view seems to have been a favorite for having fun with variations in colors and design details, although the overall layout remains stereotypical. The worst craftsmanship of all seems to appear on items featuring a third rather awkward hybrid pose: the sprawled body with outspread claws of the frontal pose combined with a sort of three-quarters profile head. In many versions of this hybrid Pose 3, basic artistic mistakes can be seen such as the awkward spots where the head overlaps the body, often seeming to sever it. This pose seems to cluster in items made from the 1930s through the 1970s, and may have been the favorite of one particular artist or workshop. I haven’t been able to find examples that are unequivocally from earlier decades, and none at all signed by Lao Tian Li. Simplified versions of dragons in all three poses often look bulb-nosed and cross-eyed, with a jelly bean chin. 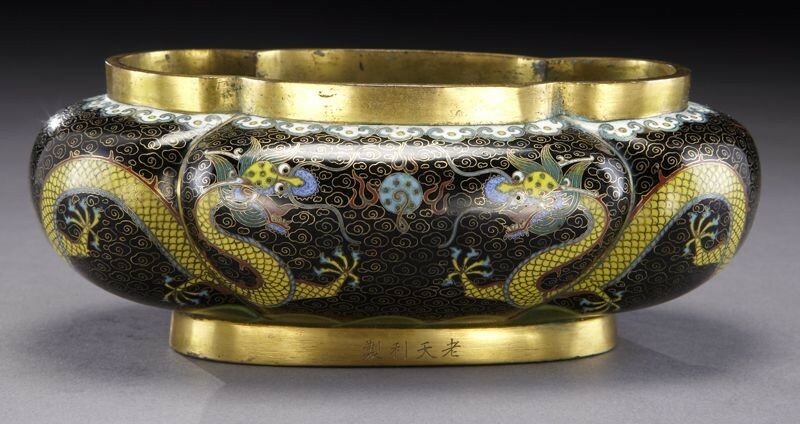 Pre-World War 2 Chinese cloisonné production seems to have been a combination of high quality pieces produced by urban workshops under a master or masters, and a cottage industry in villages that produced folk-art items to sell for cash to supplement their agricultural income. Once the basic dragon stereotype was set, it was adhered to even in the more casually made household bric-a-brac. If one’s task is to work with standardized pieces and a memorized pattern, turning out the same basic design over and over, neatness and efficiency are probably of greater concern than personal artistic expression. Nonetheless, even in small and presumably less expensive pieces such as matchboxes, a difference is obvious between pieces made by someone with artistic ability who cared, and by someone who was just doing work. My cute litte dragon box - the cloison wires are hair-thin. tA small inro-style purse of careless work. It can be hazardous to try to date a piece from the hodgepodge of painted, stamped, engraved, or papered labels that might have been applied. I (and apparently many online auction sellers) have difficulty sorting items into approximate age categories – Late Qing? Early Republic? Roaring 20s? Depression 30s? Warring 40s? Nonetheless, production does seem to get less detailed and meticulous around the 1930s, for entirely understandable reasons – worldwide economic depression, wars, occupation, and older Qing-era craftspeople fading from the scene. 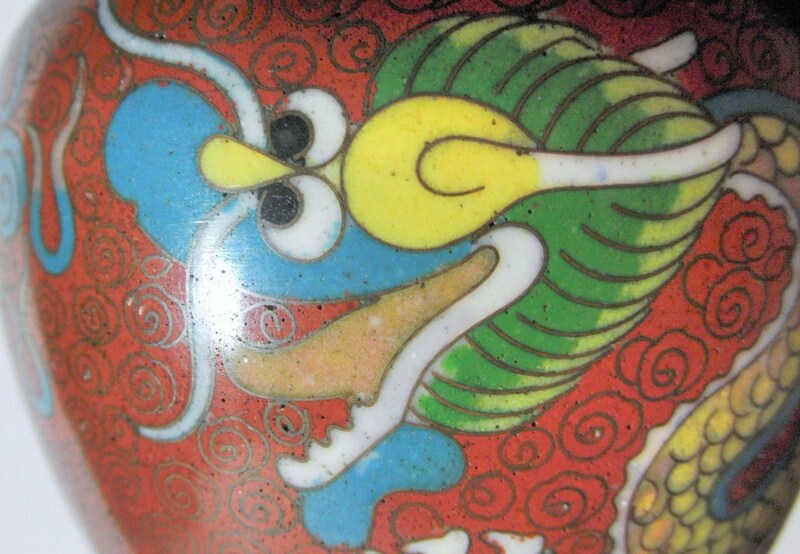 A crude four-toed dragon, often with black eyes, seems to have appeared on beads and fashion accessories around the late 1930s. 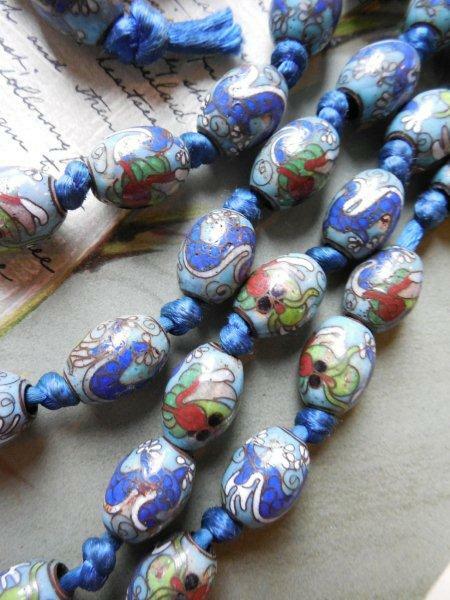 These beads show up in Japan as well as in the United States - more on them in an upcoming post. 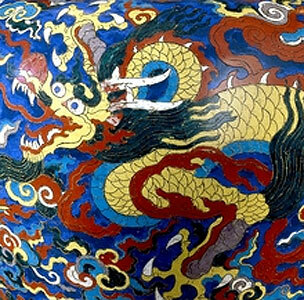 The JingFa cloisonné factory was founded in 1956. By this time the People’s Republic had been through a terror and political purges, but Mao’s Famine and Cultural Revolution were still to come. Collectivization of the agricultural villages and famine likely reduced the population of part-time cottage artisans. 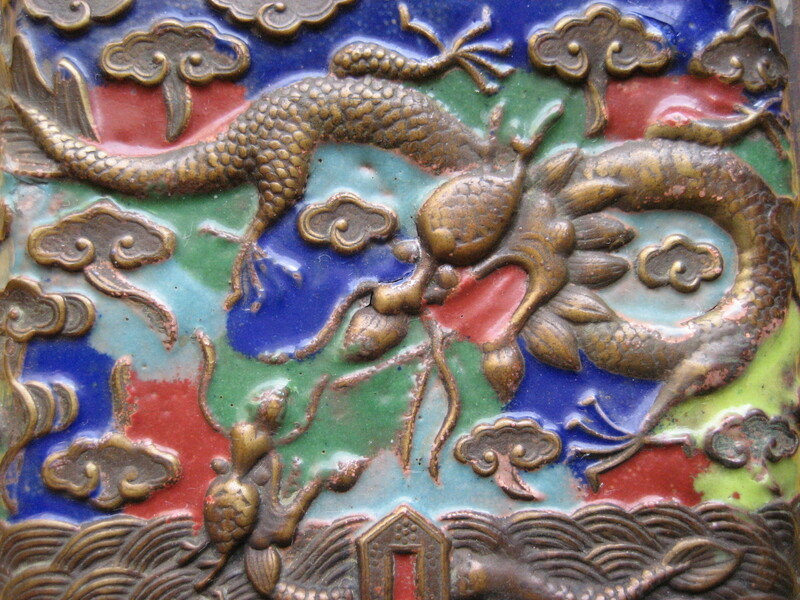 It’s difficult to see how high quality cloisonné production could have persisted under such circumstances, but apparently some artists and workshops struggled onward trying to produce well made versions of traditional Chinese motifs, revolutionary themes, and “modern” designs that might appeal to foreign buyers. By the early 1970s arts and craft production was being encouraged by the government in order to earn foreign exchange (Pier One Imports and Lillian Vernon come to mind). The Montreal Gazette of Oct 2, 1973 recounts how despite the ongoing Cultural Revolution the remaining older artisans had to totter out of the back rooms and show the newer workers how to make the old-style designs instead of revolutionary themes. The last gasp of the older dragon stereotype seems to occur around the 1970s. Then it appears that newer artistic directors took over in the factories and workshops and instituted their own standard dragon patterns and motifs. Small bowl from c1930s on left, similar bowl from 1980s-90s on right.